Wyoming demonstrates its dedication to education by spending nearly $1.5 billion of its state budget on education. Wyoming is also one of the top states in dollars spent per student. The state’s commitment, along with a statewide average of 12.4 students per teacher, ensures the highest quality of education for students. Thermopolis has public schools of excellent quality, special education facilities, an adult education outreach center, and a community college within one hour’s drive. Hot Springs County School District serves Thermopolis, East Thermopolis, Kirby, and the surrounding areas with Ralph Witters Elementary (grades K-5), Thermopolis Middle School (grades 6-8), and Thermopolis High School (grades 9-12). New buildings, additions, remodels, and careful maintenance help keep the schools, libraries, playground, and athletic facilities modern and safe. With a total enrollment of fewer than 700 students, the district takes pride in its friendly, caring schools where they are afforded the time and resources to give individualized attention that each student deserves. The Northwest Wyoming Board of Cooperative Educational Services is an organization that provides cooperative services to eighteen school districts in Fremont, Hot Springs, Park, Washakie, Big Horn, and Converse Counties and to other educational and human services throughout the state of Wyoming. The NWBOCES operates the Big Horn Basin children’s Center, a residential educational placement for emotionally disturbed youth and multiply disabled youth. Big Horn Basin Children’s Center offers an accredited academic program for grades K-8, designed to meet the individual needs of each student. The educational staff is composed of certified elementary teachers, special education teachers, and highly qualified paraeducators. Here students will receive the individualized and often one on one attention that they need to progress at their own rate, in accordance with their own skill development. In addition to the academic program, NWBOCES team offers group, individual, family therapy & related services as a component of the Behavioral Treatment Program. Big Horn Basin Children’s Center provides medication supervision by consulting psychiatric staff, a pharmacist, and a school nurse. Medical problems are addressed by local physicians and medical specialists per referral basis. The Children’s Resource Center is a non-profit state approved agency that provides special education and related services to children with disabilities between the ages of birth through five. Children’s resource center is nationally accredited through the National Association for the Education of Young Children, and the services are provided with no cost to the families. The teachers and therapists are professionals, licensed and / or certified in their fields, and are highly dedicated to providing a high quality early intervention program for young children which focus their developmental and educational needs, and to offer support to their families. Located just 56 miles south of Thermopolis is Central Wyoming College, located in Riverton, Wyoming. 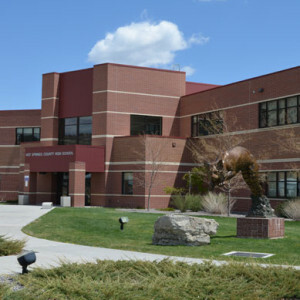 Central Wyoming College is a two year college, which offers transfers, occupational education, work force education, and adult education programs. Central Wyoming College is also able to offer educational opportunities in Thermopolis and Hot Springs County through the Thermopolis Distance Education Outreach center. Various credit and non-credit courses are available for area individuals in who want to improve their academic or vocational skills, or for those who wish to develop new skills. “Live Classes” are led by instructors and are usually taught in the evenings at school facilities. Basic courses needed to obtain an Associates Degree from CWC are offered. The CWC Thermopolis Outreach Center office is located within the Hot Springs County School District facilities, and is a source of information for referrals to get the prospective student on their way to a higher education.